Home » H.A. 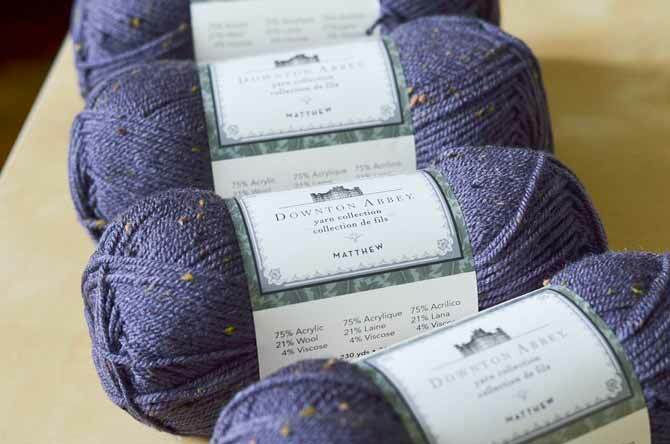 Kidd knitting supplies » Introducing the NEW Downton Abbey Yarns! This week we have a brand new set of yarns to show you, here on the KNITmuch blog. 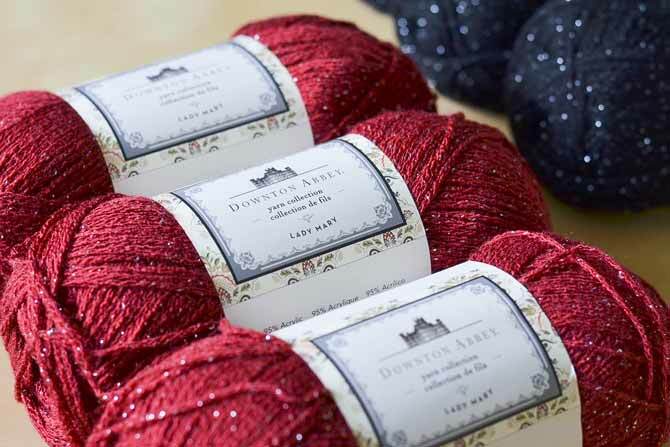 The Downton Abbey Yarns are new for this fall and winter season, and feature four different yarns, each named for a different character on the Downton Abbey show. We’re thrilled to bring two of these yarns to the blog this week, and chat about some patterns and ideas for how to work with them. New yarns can lead to great new knitting projects! The new Downton Abbey Yarns are fun to knit with and so versatile. If you haven’t had the chance to branch out to different kinds of fiber combinations in your knitting projects so far, the Downton Abbey Yarns will give you the chance to try out a few interesting blends. If you’re (like me) a fan of the show Downton Abbey, you might be able to guess what kinds of yarn have been made for each character! The Matthew yarn (pictured above) includes some tweedy wool for a very rustic look. Can’t you imagine him walking around the Crawleys’ estate in a vest made from this flecked yarn? The Matthew yarn is a worsted weight blend of wool/acrylic/viscose and would be so versatile for accessories, garments, or even blankets and pillows. There are a lot of possibilities and the color selection is very much in line with the outdoors palette, lots of naturals and rustic tones. The dark purple (far below) is another great color in this line, and many would be great choices for either men’s or women’s projects. The Lady Mary yarn line includes sparkly threads woven through the yarn, for extra elegance! On the other hand, Lady Mary makes us think a bit more about the elegant indoor social life side of things! So it’s no surprise that the Lady Mary yarn line includes a bit of shiny silvery thread woven through the yarn. I think this would be a perfect yarn for holiday accessory projects. Shawls, scarves, and fingerless mitts would be lovely with that extra touch of shine. 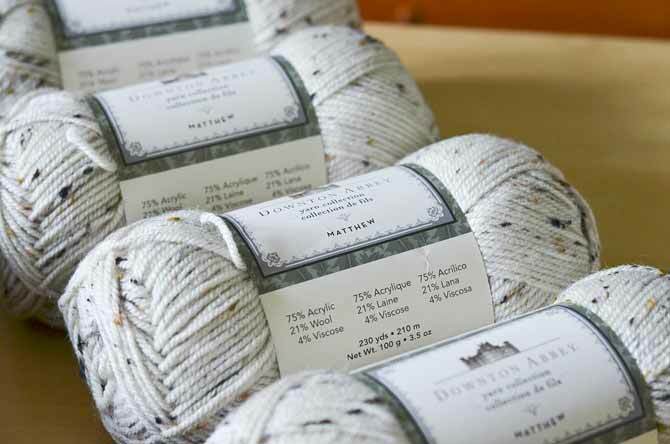 The Matthew yarn line is a tweedy blend including 25% wool, for a rustic tweedy effect. This is just the first hint of what we’ll be showing off this week. We’ll look at some of the patterns designed just for these yarns – available for free! – as well as some other selections from around the web. There are a lot of knitting and crochet projects to choose from out there so finding three or four that you like for even just one yarn, can seem like a very short list some days. But, I think that’s half the fun. New yarns can lead to great new knitting projects! Stay tuned for a fabulous week of knitting in Downton Abbey style! I love all the yarns. 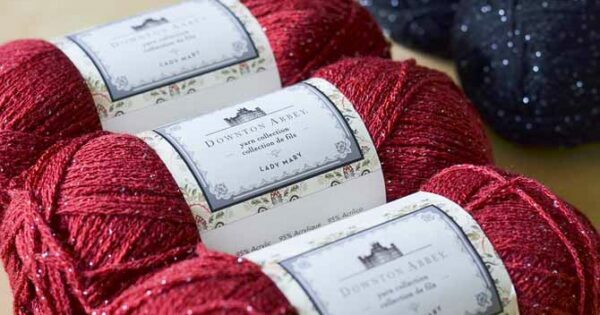 I like the look of the Downton Abbey yarn, will it be available in Australia please?